Way back in 1997, we had a Windows 95 computer that we got when the triplets graduated from high school. I don't remember if we had AOL yet, or if we were still using Juno, but suffice to say that there wasn't much to do on a computer, so, after familiarizing myself with all the system settings, I started fiddling around with MS Paint. My favorite video game franchise at the time was the Donkey Kong Country trilogy for the SNES (it's still pretty darn good--I recently played it through on the Wii), and I decided I would make a desktop wallpaper for myself. I started with the idea of drawing the characters, but it eventually morphed into this 640x480 bitmap drawing (here provided in losslessly compressed PNG format, click the graphic for the full version): I had previously drawn 32x32 renderings of each family member, and created icon files, so that when you used the Send To menu, you got a pictorial menu of the different user desktops to send a file. I'm pretty sure I'm the only one who ever used that feature, but later on my sister Sarah and I collaborated on a cross-stitch of the whole family: I drew the pixel drawings, and she adapted them slightly and made cross stitchings out of them. I'm pretty sure she had the harder task, but we both had fun being creative. I still have all of the original element files. The leafy background is the same leaf, stretched and flipped in various ways. The one tool I used besides MS Paint was WordPerfect's image blur feature on the completed leaf background. Each of the drawings was done by hand, pixel by pixel. The top right quadrant depicts Donkey Kong Country, with DK and Diddy in one of the snow levels. 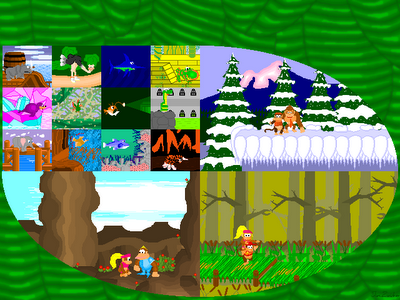 The bottom right is Donkey Kong Country 2: Diddy's Kong Quest, with Diddy and Dixie in one of the swamp levels. The bottom left is Donkey Kong Country 3: Dixie Kong's Double Trouble!, with Dixie and Kiddie Kong shown in one of the canyon levels. The top left quadrant depicts each of the animal helpers (I had to stretch the definition of 'helper' in order to include Nibbla, but since he defeats other fish for you, I say it counts). Anyway, I hope you enjoy this piece of my childhood. If you like it, please leave a comment.